Considered one of the best potential sources for extraterrestrial life in the solar system, Jupiter's moon Europa may host life in the ocean deep beneath the moon's icy crust. 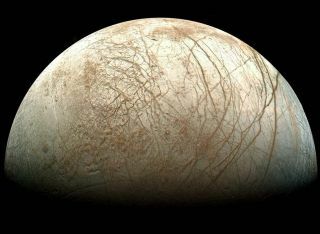 Some organisms could even travel to Europa's surface through cracks and instabilities in the crust, some researchers speculate. But radiation from Jupiter's magnetosphere constantly bombards the moon and could annihilate life at shallow depths, making it difficult to detect with an orbiter or lander. So scientists are seeking to determine experimentally just how deep organic life on Europa needs to hide in order to avoid being destroyed. Jupiter's magnetosphere blasts Europa — which is slightly smaller than Earth's moon — with high-energy electrons in the megaelectron volt (MeV) range. But most of the scientific data on how high-energy radiation affects organics has focused on the medical field, where studies seek to determine how chemotherapy affects the human body. That research focuses on water, the body's primary component. "Even in the megaelectron volt range, we do not have any laboratory data that has been measured on ices containing organic matter, which is really important for astrobiology," Gudipati said. Gudipati and his team placed organic detector molecules behind ice of varying thickness, then fired an electron gun at them. They measured not only how deeply the electrons themselves traveled, but also the penetration of the photons knocked loose by the electrons — a secondary effect that other experiments have not tracked. "Those photons can penetrate far deeper and cause damage to organic matter," Gudipati said. The process is akin to placing a person behind a wall and speaking at different frequencies while changing the thickness of the barrier, he added. Except, of course, the frequencies studied here can kill organic molecules rather than converse with them. Wes Patterson, a planetary scientist at Johns Hopkins University, compared the effects of Jupiter's radiation to the doses people can get during a visit to the hospital. "There's a reason why lab techs wear lead vests when giving X-rays," Patterson said. "Exposure over a short time may not do too much to you, but if you're constantly exposed to radiation, it will harm the body." He reiterated the importance of the research's experimentation with ice rather than water calling it "a vital first step." Europa, a moon among many circling Jupiter, appears to have a putative ocean hidden under its frozen surface crust. Tougher cameras, however, will be necessary to scope out the water regions beneath its shell of ice. The team focused on low-energy electron radiation, up to ten thousand times less than the intense barrage pumped out by Jupiter. In this lower range, the depth to which the electrons penetrate is directly related to the strength of the radiation. The researchers considered three scenarios as the bombardment increases in strength. Two take into account potential changes that may come with depth; at stronger energies, the electrons could do more or less damage, which the team has calculated. However, if the results remain the same at higher energy levels, radiation of 100 MeV will penetrate between 60 to 80 centimeters (23 to 32 inches). The team plans to extend the study on the effects of increased radiation energy incrementally. One reason for the gradual extension is because not all of Europa experiences the same exposure. Jupiter's magnetosphere rotates with the planet, about every ten hours, while it takes 85 hours for Europa to orbit Jupiter. Consequently, the magnetosphere constantly overtakes the moon, exposing the back side, or trailing hemisphere, to more radiation than the front. The equatorial region of the trailing side suffers more damage than its poles. "We need to understand how that depth varies with location," Patterson said. That's something Gudipati hopes to achieve. "We need to do step-by-step lab studies covering as much of the region as possible that is pertinent for Europa," he said. Eventually, he hopes to run experiments at energy ranges comparable to Jupiter's magnetic field, though he noted that each step will grow more expensive. But when it comes to preparing a mission to Europa, the cost of insufficient knowledge could be higher. "If we are investing millions or billions [in a mission to Europa], then it is worth investing half a million to a million dollars to get this full range covered," Gudipati said. Patterson agreed. "This looks like a really great start on something that would be important for future consideration for landing on Europa, and even for trying to understand what we could observe from orbit." Such experiments could help create realistic goals for potential missions to Europa. Without them, finding organic molecules on the icy moon could be far more challenging, researchers said. "If we do not know how deep to dig through lab simulations, we will be tossing a coin," Gudipati said.